Batting: Shane Dowrich 125 off 325 balls, Jason Holder 40 off 88 balls, D Bishoo 40 off 160 balls, K Roach 39 off 95 balls. Bowling: Kumara 4/95 in 31 overs, Lakmal 2/55 in 29 overs, Herath 1/67 in 32 overs. Batting: Angelo Matthews 11 off 15 balls. Bowling: Roach 1/2 in 3 overs, Gabriel 1/17 in 4 over, Jason Holder 1/5 in 1 over. After a brief delay in the play due to rain, West Indies batsmen and Sri Lankan team made their way onto the ground. 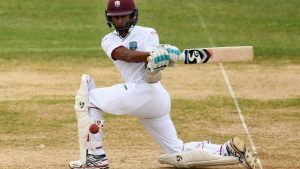 Sri Lanka hoped to take the remaining 4 wickets, while West Indies wanted David Bishoo and especially Dowrich to take them to 400+ runs. The pitch was helping the bowlers as both batsmen were facing difficulty in getting the bat on the ball. However, when both batsmen came back after rain had yet again halted play for the 2nd time, they looked quite solid and began to score off runs easily. And, suddenly it looked like WI had a plan in place. As it was Dowrich who was scoring from one end. While Bishoo who was tiring out Sri Lankan bowlers by playing a huge amount of dots. Both batsmen reached the 50-run stand and at this point Sri Lankan bowlers were looking toothless and out of luck. David Bishoo’s ball control percentage at this point was 85% which was exceptional considering he was playing with a strike rate of 22. Which was frustrating the Sri Lankan bowlers repeatedly. But, Bishoo’s prowess with the bat couldn’t take him to a fifty as Lakmal took his wicket in his 22nd over and broke the 102-run stand. However, this wicket didn’t affect West Indies and Shane Dowrich one bit, as the wicket-keeper batsman struck his century 10 overs later. Shane Dowrich struck his second Test century off 282 balls just on the stroke of the tea break. From here on, things only became much worse for Sri Lanka as the new batsman Roach and Dowrich added another 75-runs on the scoreboard. And, after Kumara claimed Roach’s wicket, West Indies decided it was time to declare. West Indies should just declare. It’s over. Cricket fans also felt the same and finally Jason Holder declared the innings on 414 runs. Sri Lankan openers Perera and Chandimal now had to make sure they didn’t give away their wickets in the remaining part of day 2. But, their plans were disrupted by Roach who struck in the very first over as Perera to send Perera with a golden duck. Mendis joined Chandimal on the crease but his stay was short lived. As, this time it was Gabriel who took his wicket and Sri Lanka were 2 wickets down at this point. Angelo Matthews was the new batsman on the crease. But even he couldn’t retaliate to West Indies superb bowling. As, he became the victim of Jason Holder who got him out in the 10th over of the match. This was also the last over of the match as Sri Lanka ended the day with 7 wickets in hand. 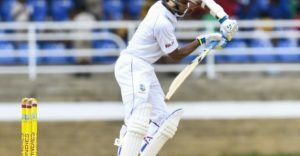 West Indies are clearly on top at this point and they will continue to be if they take a wicket or two quick wickets on Day 3 of West Indies Vs Sri Lanka 1st Test. Join Allsportspk tomorrow for Day 2 of West Indies Vs Sri Lanka 1st Test.